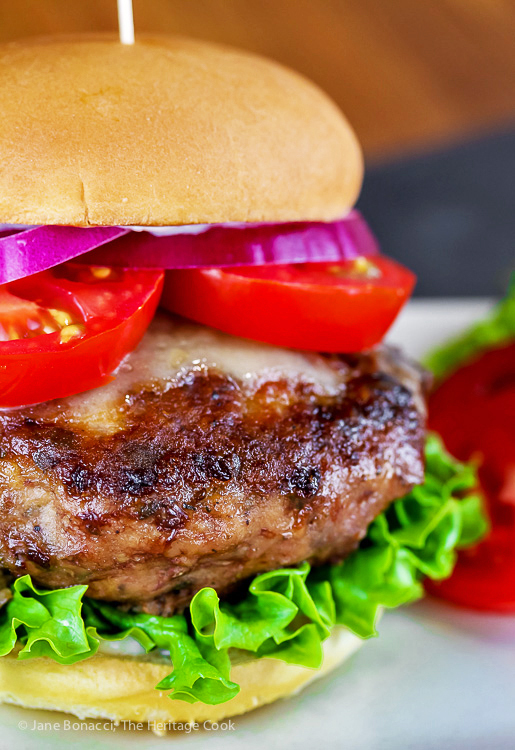 When was the last time you had a rich, luscious, tender, moist turkey burger? I’m betting it is rarely and possibly even unheard of until today. This French Duck Confit Burger with Gruyere is remarkable. Adding chopped duck confit amps up the flavor and adds an unctuousness that turkey lacks. And rendering the fat from the skin makes it just that much more succulent! I am sharing today’s recipe with you because this is National Burger Month! During the entire month of May, follow #burgermonth on social media and discover 100 of the best and most delectable burgers ever created from some of the most talented bloggers on the planet! To make it even more fun, check out this list of prizes you could WIN – a value of $800 of the best equipment and ingredients! Don’t miss out on this amazing opportunity. Head over to BurgerMonth.com to enter today! Can you believe these prizes? Wow! These are some of the best companies in the business sharing their products with us, what an honor. Thank you for providing such amazing prizes! Scroll down beneath the recipe for more ways to keep in touch with all of them! Cooking the burger and toasting the bun at the same time on Anolon’s Griddle/Grill Pan! Burger Month is the brainchild of Kita of #GirlCarnivore. This is the third annual #burgermonth, a celebration of burgers of all varieties and styles. You will see some made with traditional beef, others with alternative meats, some with special sauces, hidden treasures inside, some for breakfast, others for special occasions, and many more. I think mine probably falls into the special occasion category – you don’t break out the duck confit every day of the year, LOL. Duck confit is one of The Artist and my occasional indulgences. If you haven’t had it before it is decadent and a true treat. To confit anything means to cook it slowly in its own fat, making it fall-off-the-bone tender and juicy. For duck it is almost always the legs that are prepared this way. We find ours at the butcher, gourmet grocery stores in the Bay Area, or online. If they are vacu-packed, they can be frozen for a month or two. I love having them on hand for special occasions and saved one just for these burgers! These burgers are amazing! While the duck isn’t a dominant flavor, it added texture and complexity as well as much needed fat. In fact, I removed the skin from the leg (before dicing the rest of the meat), put it in a small saucepan over medium heat, and browned it to render the fat. Then I poured that fat over the turkey meat for a little more luxury. Keep an eye out for overcooking the turkey. Because it is so lean, it can quickly become dry and tough. Pull the burgers about 5-degrees under the ideal temperature and let them rest, loosely covered with foil, to finish cooking. With the resting period, they will come out perfect every time! Because duck confit is a traditional dish in France, and to keep in the French theme, I added aioli (ay-oh-lee), a Provençal condiment, is a homemade mayonnaise with garlic. To make it easier and safer (no raw eggs), I make mine with store-bought mayonnaise and add seasonings to it. And to finish off the burgers, I melted Gruyere over the top. Every bite is packed with luscious flavor, great texture, juicy moisture, and when combined with all the condiments makes every single bite pure heaven! Be sure to enter for a chance to win one of four prize packages at BurgerMonth.com, check out all the recipes from this year’s Burger Month, and head over to our sponsors to see all their products! Bookmark all of these incredible burgers this month to enjoy all year long! Duck confit can be quite salty depending on who made it. Always taste it before seasoning the rest of the meat so you don’t wind up with an inedible salt bomb! Always check with the producer of the duck confit to be sure there are no gluten ingredients added during cooking and packaging. Prepare the Aioli: Using a mortar and pestle, pound together the garlic cloves with the coarse salt until you have a paste. Add the garlic paste to the mayonnaise, whisking until evenly distributed. Gradually add the olive oil to the mayonnaise, whisking constantly. Stir in the lemon juice and add sea salt to taste. Aioli can be placed in a tightly covered container and stored in the refrigerator up to several days. Keep refrigerated and use cool. Make the Burgers: Remove skin from the duck and cut it into chunks. Place in a saucepan and cook over medium heat to render the fat. Set aside to cool slightly. Pour the rendered fat into a large mixing bowl. Cut the duck confit away from the leg bones (leaving as much fat on it as possible) and then very finely chop. Taste the meat to see how salty it is and adjust your seasoning of the turkey accordingly. Place the duck in the bowl with the rendered fat. Add the ground turkey, thyme, and season to taste with the salt and pepper. (To test seasonings, once blended, pinch off a little of the meat and cook it in a skillet. Taste the cooked meat and adjust seasonings of the raw meat if needed.) Mix thoroughly with your hands, divide into 4 equal pieces and pat into flat rounds. Press a deep indentation in the center of each one with your thumb. Cook the Burgers: Heat a grill, grill pan, skillet, or griddle over medium to medium-high heat. Cook the patties until browned about halfway up the sides before flipping and finishing on the second side. Reduce the heat to medium to medium-low to help extra thick burgers cook all the way through. An instant read thermometer will register 160°F to 165°F when they are at the perfect temperature; remove from the heat. Just before they are done, add a slice of cheese to melt slightly. Move burgers to a plate and keep warm. Toast the buns, brushed first butter if you like. Assemble the Burgers: Spread a generous amount of the aioli on both halves of the hamburger buns. Place a lettuce leaf on the bottom half and top with the hot burgers covered with the melted cheese. Top with some of the red onion rings and place the top halves of the buns on the burgers and serve immediately. Pass additional aioli at the table with some good French mustard if you like. By Jane Bonacci, The Heritage Cook © 2017. All rights reserved. Disclosure: I received an Anolon 10″x 18″ Double Burner Griddle and Grill Pan for testing and recipe development. I was not compensated for writing this article and I did not receive any additional compensation from any of the other sponsors. As always, my thoughts are my own. Welcome! If you ever need any entertaining or cooking advice, need to alter a recipe for gluten-free, or want recipe suggestions, don’t hesitate to ask. Feel free to quote me, just give credit where credit is due, link to the recipe, and send people to my website. Unauthorized use, distribution, and/or duplication of proprietary material from The Heritage Cook without prior approval is prohibited. If you have any questions or would like permission, please contact me. The suggestions here are not intended as dietary advice or as a substitute for consulting a dietician, physician, or other medical professional. Please see the Disclaimers page for additional details. Thanks for visiting The Heritage Cook!